Young riders will go cuckoo for the park's Driving School as they take their test on a network of roads nestled amongst the ruins of the historic Towers. Drivers have complete control over their cars and choose their own route around the course guided by Dolly the Lollipop Lady. Will you drive through the bubbliest car wash in the world or perhaps you want to take a drive through colourful crazy cone course? Just make sure you stop for the hedgehogs as they take advantage of the zebra crossing. Drivers first receive a safety briefing from Dolly before they enter the course and pick one of the brightly coloured cars. Once everyone's seated the fun really begins as you take to the roads to see what you discover. Parents can watch the action from the bridge over the course safe in the knowledge that the remote safety controls allow their children to enjoy the experience of freedom, yet with complete control by the ride operator. At the end of the experience, riders can obtain their very own driving licence from the nearby shop to prove they've passed their test. 2006 was a big year for Cred Street with the opening of the park's big new ride, Charlie and the Chocolate Factory. By the start of the season however some late construction had started, closing off the other end of the area as well. It had long been on the cards that the old Vintage Cars and Cred Street Carousel were due to be removed from the park and as the season opened their fate was sealed. The bottom end of the street disappeared behind construction walls, ready for the Summer opening of a new attraction. Soon, the whole bottom end of the street was awash with larger than life characters as the Peugeot 207 Driving School opened in July. The entrance to the attraction was through the area's former Sweet Shop, which only ever sporadically opened during the Cred Street years. Over the way from the Driving School, the former Fabulous Toy Shop was converted into a Peugeot showroom. The showroom also housed a new Education Centre as well as a kiosk where young drivers could get their souvenir photo driving licence. In 2010, the attraction lost its link with the Peugeot 207 (which loosely inspired the design of cars), becoming known simply as the Peugeot Driving School. 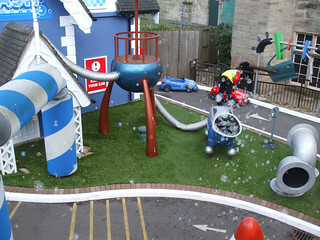 Part of the change also saw the Peugeot showroom converted into Rory's Play Den, a small scale fun house style attraction which featured fun and games, such as fairground mirrors. 2012 saw the sponsorship deal with Peugeot end, with the ride receiving a minor refresh to remove the Peugeot branding, though the cars remained the same design. Over the way from the main attraction, 2012 also saw a remote control Driving School sideshow added to the unit next door to the Education Centre. 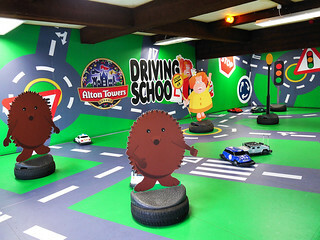 The Driving School has proven to be a very popular children's attraction but in 2016 the attraction closed for the duration of the season, ostensibly as part of the park's TLC programme. 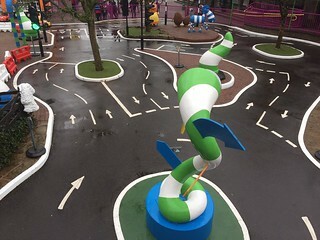 The attraction reopened in 2017, having receiving a colourful update that saw the ride transformed into Cuckoo Cars Driving School.